With spring underway it’s time to turn your attention to the garden, and those lawns, borders and patios will need clearing up for the summer! It’s great to be able to spend time outdoors in the warmer months, and having a nicely tended, prepared and equipped patio or decking area adds to the practicality of any garden. If you’re looking for ideas that will give your garden areas a little something special this year, we have some great tips for you. We’re going to tell you about garden lighting, and why it can really add something to even the smallest of outdoor spaces. It’s fun to carry on enjoying the garden into the evening, and a waste to miss out on those wonderful warm summer nights. With garden lighting, you can have friends around long into the night, or just spend time outdoors with your family after sunset, and enjoy your relaxation time to the full. 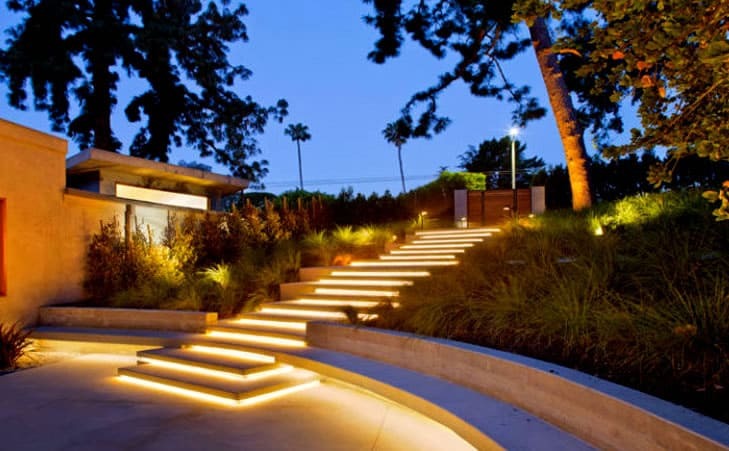 So, without further hesitation, here are seven great ideas for garden lighting for your inspiration. 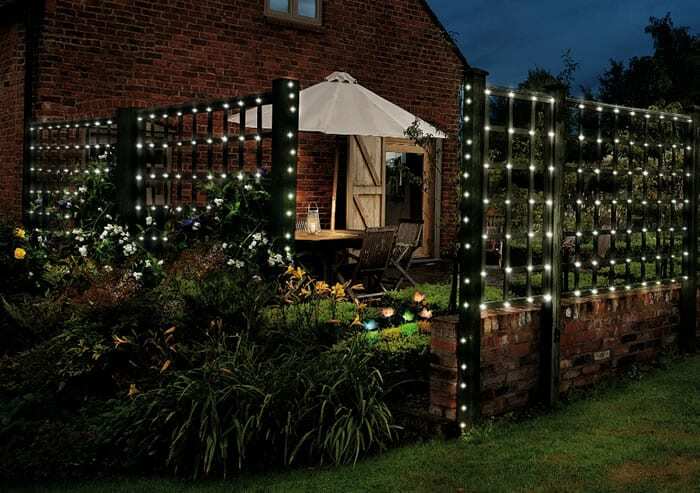 If you’re looking for a cheap and simple way to add light to your garden – and to create a light-hearted and welcoming look – then the best way to go may be to use strings of fairy lights. You can find these in a wide range of types, colours and lengths – make sure they are for outdoor use – and they look great draped across fences, hedges and shrubs, or even lighting up trees. Shop around for lights that can be set to flash or go through a series of options, and you’ll find they make an attractive addition. One of the most effective methods of giving atmosphere to your decking or patio is to set lighting at ground level. You can buy affordable spotlights, for instance, that can be recessed into the decking itself. These add a great effect, as do lights that you can either stand on the ground around your outdoor social area, or fit on low walls. Either way, a low wash of light from uplighters will always be soft and effective. 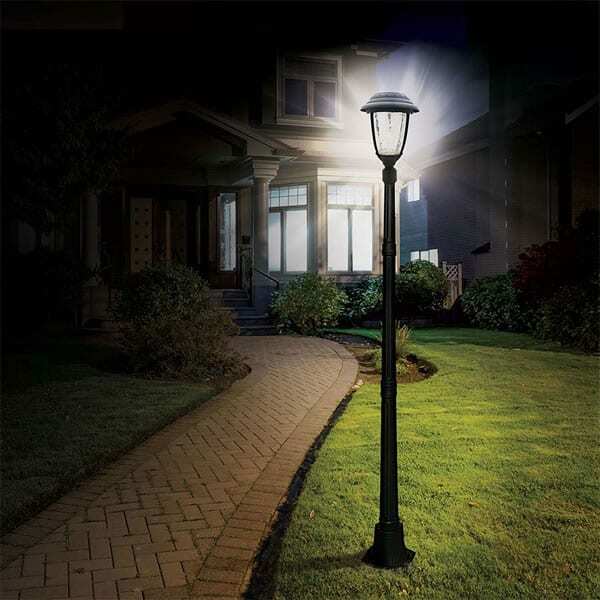 One very effective and surprisingly affordable method of lighting your garden is to fit solar powered lamp posts in select positions around your property. These come in a variety of sizes and styles – from the sleek and modern to antique-look traditional models – and as they are solar powered, you don’t need cables trailing to the nearest power outlet. The versatility of solar powered lights in the garden can’t be overstated, and you’ll find them among the cheapest outdoor lights to buy, fit and run. There is a vast range of products, some that are great for lining pathways, others that would be excellent as a central lamp on a patio. 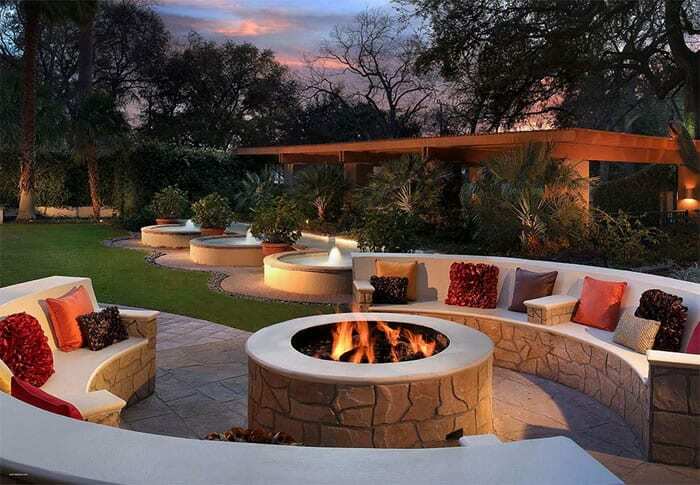 One of the trends in outdoor features of recent years has been the fire pit. There’s nothing better than a bunch of friends sitting around a roaring fire in the garden, having fun and enjoying the company. You can buy a fire pit for your garden quite cheaply, or you can build a permanent one yourself. Check out Pinterest for fire pit inspiration. There are plenty of videos on YouTube, for example, that will help you build an effective and attractive firepit quite easily, or if you prefer a ready made one, check out the deals at your local garden and hardware suppliers. You know those LED strip lights you have in your kitchen, hidden behind the lip beneath the cupboards? They give a great lighting effect, don’t they? Well, why not transfer that idea to the garden? If you shop around you will find there are many examples of outdoor-use LED lights that are perfect for mounting on a wall, around the edges of your decking, or even on the top of fences. You can use them for a soft glow or buy more powerful versions for added light, and they are very cheap to run too. Check out online suppliers for great deals, or your local hardware store may stock what you need. If you have walls around your outdoor area, you have the perfect opportunity to use affordable and effective wall washer-type lights. 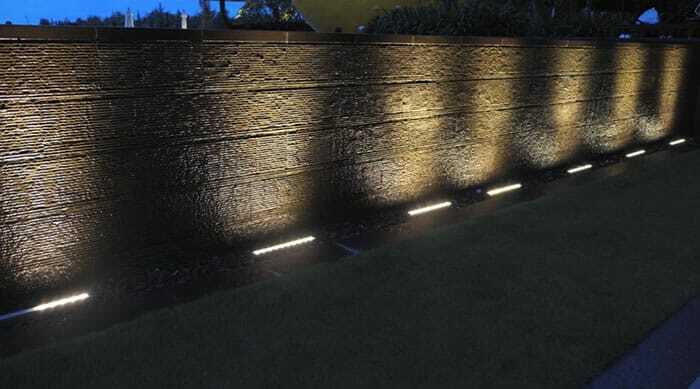 These are great fitted at the top of the wall – or a fence around decking, a patio or garden – and provide the opposite effect to uplighters, in that you can direct a soft wash of light downwards, illuminating the chosen area beautifully. After all, you don’t want to light the patio or decking to daylight levels as that defies the point of enjoying the darkness, and these lights may be the perfect answer. You can also find solar versions of these that mean you don’t need an electrician to fit them. You might think that water and electric lights don’t go together, but in fact you have a couple of interesting options. A water feature – whether it’s a traditional pond or a waterfall feature – is always a great touch in a garden, but if it’s it is even better. You can buy lights that go in the water – fully sealed and safe – that add a quite wonderful effect. They come in many types, and you can buy a variety of colors. Or, you might simply want to mount lights above the pond, or spotlight it for added effect? Either way, it’s a great garden feature, a beautiful thing to look at, and a talking point too. That said, it’s not the easiest or cheapest item on this list to install and maintain, so you might want to check out the requirements before heading out and buying the lighting. That’s our list of 7 wonderful and affordable lighting ideas for your garden and outdoor areas, and none are expensive. Remember, if you are fitting hard-wired lights you will need to find a qualified electrician to do the job. For solar lights – perhaps the best option for the garden – and those that plug into a power outlet you can do it yourself, so what are your waiting for? We hope we’ve given you the inspiration to make sure your garden is beautifully lit for the coming summer, so enjoy it to the full.